The magician shows his audience an empty paper bag and invites a spectator to put his hand inside to confirm that there is nothing in it. Immediately, the magician puts his hand in the bag, and makes a beautiful box with two flowers appear. After a moments surprise, he puts his hand in the bag again, and makes another box appear. 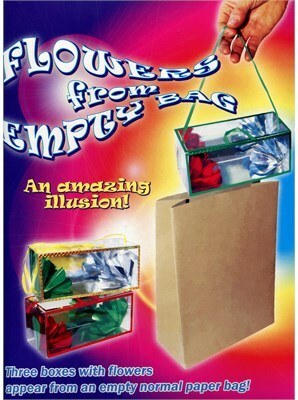 Finally a third box with flowers inside magically appears from the empty bag... the audience will remain speechless!